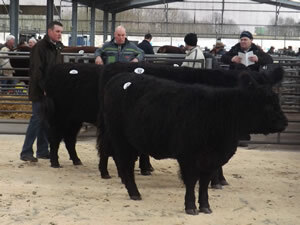 Galloways were very much in demand at the Society Sale held at Harrison and Hetherington’s Carlisle Sale Centre. 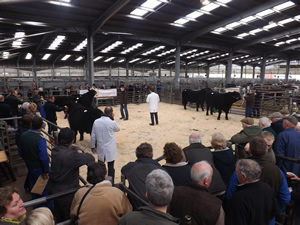 A packed ringside witness increased averages, which included a four-figure rise for bulls and only two animals not sold. Many potential purchasers would return home empty handed, as there was not enough entries to fulfil purchaser’s demands. Top price of the day was for Parknook Thunder from RH & JR Little, Parknook, Bewcastle, this May 2010 born son of Parknook Winner and out of Barlaes Grace 59th sold for 3200gns to M/s Pattinson, Hotbank, Bardon Mill, Hexham. 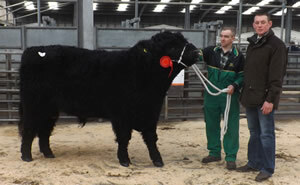 The male champion from Mr J Carr-Ellison, Hedgeley Farms, Powburn, Alnwick was Beanly Colombo, a Penninghame Nipper son and out of Blarcreen Princess, this 22 month old sold to Ardnaw Farms Ltd, Ellary Estate, Achanish, Lochgilphead, Argyll for 3000gns. The female champion and top female price was from the Fergusson/McTurk team, Barlaes, Dalry, Castle Douglas, Barlaes Grace 78th an 2011 born bulling heifer is by the homebred sire Barlaes Colossus, she sold for 2000gns to M/s Weeks, Twynffilkins, Woodfieldside, Blackwood, Caerphilly, Wales. The reserve female champion was Drumhumphry Lady Noble 815 from Andrew M Brown, Drumhumphry, Corsock, Castle Douglas, this September 2010 born Lord of Gall-way daughter made 1500gns and is off home with Mr Ireland, New House Farm, Drigg, Holmrook, Cumbria. Mr Ireland also purchased the day’s second top price, Barlaes Katie 55th another Barlaes Colossus daughter she sold for 1800gns. 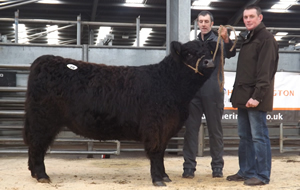 Society Chairman, Mr Andrew Waugh, Kilnstown Farms Ltd, Kilnstown, Bewcastle, Carlisle secured 1700gns each for his pair of bulling heifers, these Orinocho of Over Barskeoch daughters sold to Mr Robinson, Newhouse Farm, Holwich, Middleton-In-Teesdale, Barnard Castle. Lady Hudson Cup Winner for best pedigree male:- Mr J Carr-Ellison, Beanly Colombo.